Heat oven to 350°F (325°F for dark or nonstick pans). Grease 2 (8-inch) round cake pans with shortening and lightly flour, or spray with baking spray with flour. Tint 1 container frosting with red food color. Tint 1 cup frosting from second container with green food color. Leave remaining frosting white. Place 1 cake layer, cut side up, on serving plate; spread with half of red frosting to within 1/2 inch of edge. Top with second cake layer, cut side down; spread with green frosting. Top with third cake layer, cut side up; spread with remaining red frosting. Top with remaining cake layer. Spread white frosting on top and side of cake. Freeze 1 hour. 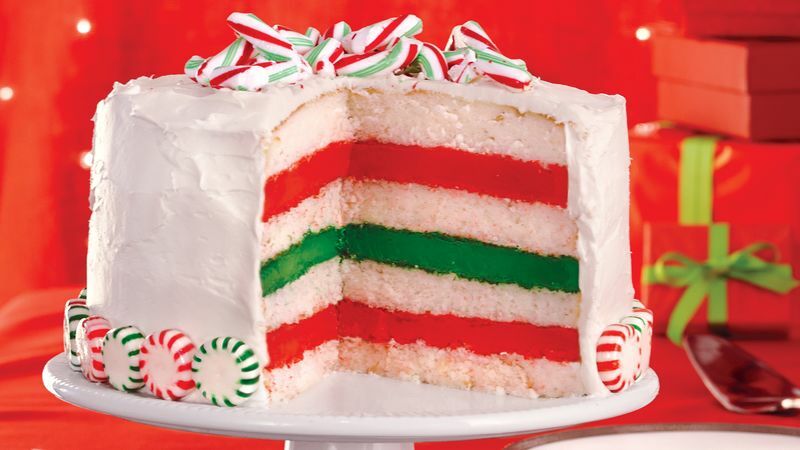 Place red and green round peppermint candies on bottom edge of cake. Break candy canes into large pieces; place in center of cake.